When the nature loses its temper, it results as Earthquakes, Floods, Droughts and Cyclones. The mankind remains just static in from of powerful nature. A disaster of this kind hit Uttaranchal Area on the night of 20 Oct 1991. When a massive Earthquake shook the land of Uttarkashi District.Several thousands of people died at once in just a few minutesâ€™ quakes. A team of 8 AryaVeers in the leadership of Br. RajSingh Arya left Delhi to serve the victims. The villages in Uttarkashi were situated very deep inside the mountains. No means of travel other than on foot were available to march on. The scenes in the whole way cannot be described here. Huge rocks fallen from the mountains destroyed each and everything in the way. 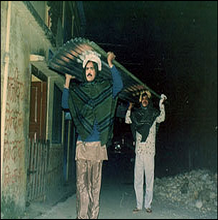 Many asleep families got buried under the huge rocks fallen on their homes. 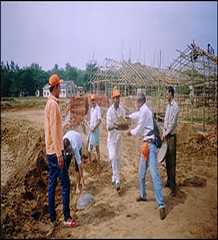 Arya Veer Dal Sewa Samiti established a Rescue Camp there and started the voluntary services. AryaVeers did relief work in various villages after the tough trekking of several hours.This Operation continued till 4 months.AryaVeers founded Arya Nagar Village there. “Arya Nagar” is the first village founded by Arya Samaj in any relief campaign. Swami Anandbodh Saraswati dedicated the Arya Nagar to the nation and the rescue operation accomplished.